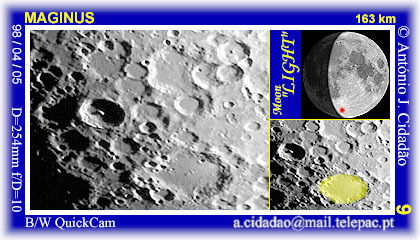 No matter what phase it presents to us, the Moon already displays some albedo features when gazed with the naked eye. 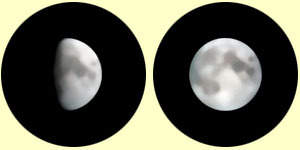 The above images (first-quarter at left, and full-moon at the right) simulate the amount of detail that is visible without any optical instrument. 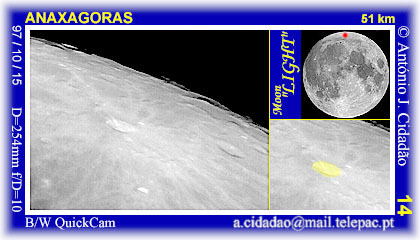 The darker regions were interpreted by earlier astronomers as seas ("maria", in latin), while the brighter portions of the lunar disk were thought to correspond to continents ("terrae"). Nowadays we perfectly know there are no oceans on the Moon, and that "seas" are just vast lava plains, but the old terminology is still being used. For instance, who doesn't recall that the first manned flight to the Moon, Apollo 11, landed on the "Sea of Tranquillity" in 1969? 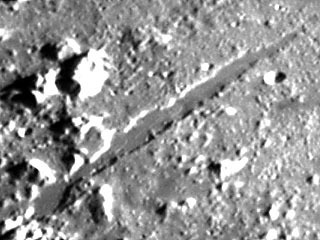 Less known is, perhaps, the site where an automatic probe, Luna 9, made the very first soft-landing on the Moon, back in 1966. It was at the western border of the "Ocean of Storms", another of our satellite's "seas". As lunar "seas" really don't exist but the designation still persists, I think we are totally free to keep on trying to see the "Man on the Moon" just for fun. For instance, I'm convinced I can spot "him" in the above right image of the full-moon. I think "he" is shouting at me..., but obviously it is just my imagination. 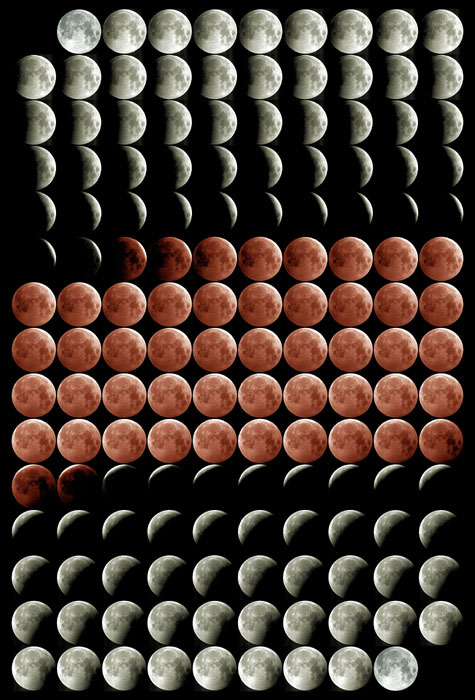 The "Man on the Moon" is nothing more than a funny pattern of "seas" and "continents" on the Moon's near-side. On the other hand, I'm pretty sure that I would not see astronauts on the Moon, even with a potent telescope, if they were there at this precise moment. 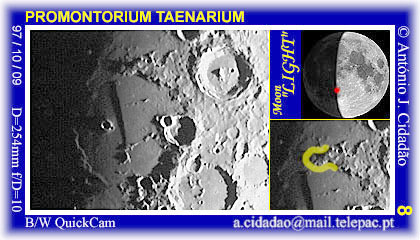 In fact, the smallest lunar features seen from Earth with large telescopes are several hundred meters in diameter. 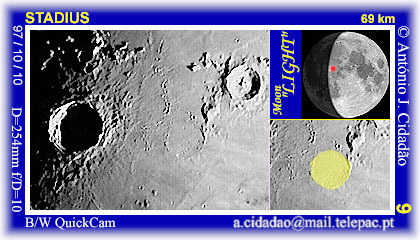 Obviously, for modest amateur instruments that figure can rise up to several kilometers! 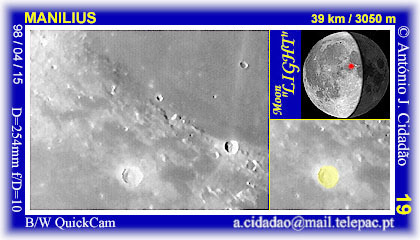 Remember..., small pits on the Moon as seen from Earth, correspond to kilometer-sized craters in reality. 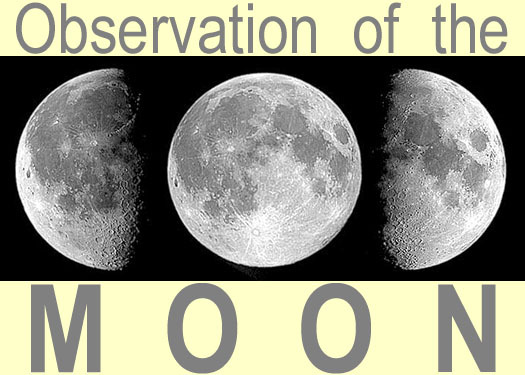 The simple use of binoculars (North up, as simulated in the above images) or of small telescopes at low-magnifications (see image below; although most astronomical telescopes invert images, all illustrations in these pages are shown with north up) already provides a lunar disk full of details to explore, namely to scan for variations throughout the entire lunation. 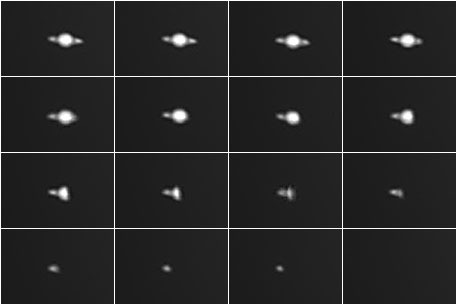 For example, the differences between the darker maria (red, in the above center image) and the more reflective terrae (green) become overwhelming. 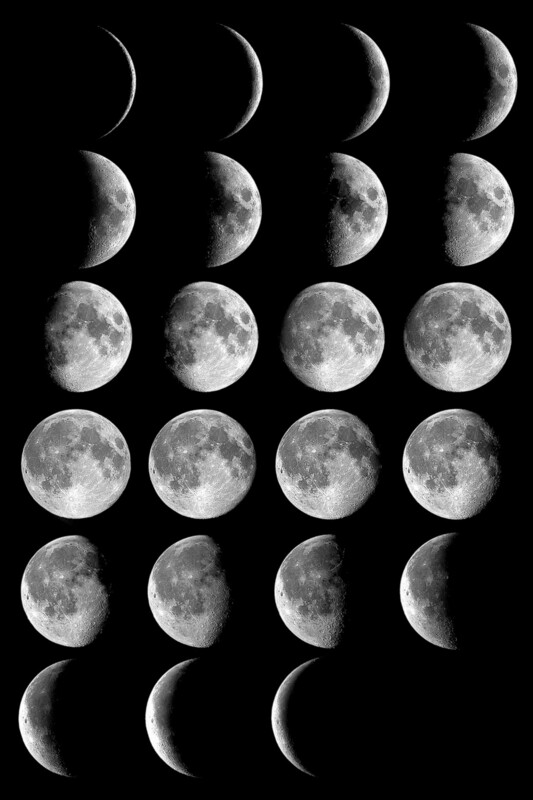 With time, any observer will become acquainted with the twenty-one maria that are visible from Earth. 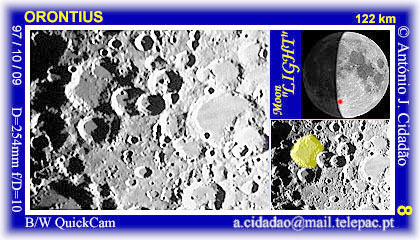 The vast Oceanus Procellarum (Ocean of Storms) is located in the western hemisphere of the Moon. 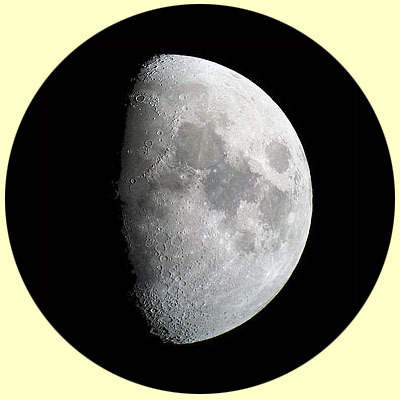 That hemisphere also contains Mare Humorum (Sea of Moisture), Mare Imbrium (Sea of Rains) and Mare Nubium (Sea of Clouds). 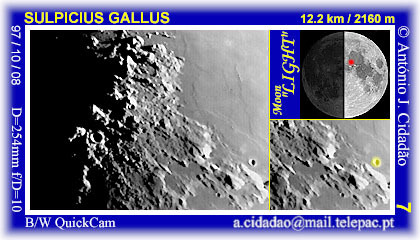 Mare Cognitum (Known Sea) and Mare Insularum (Sea of Isles) are as well located in the western hemisphere. Mare Vaporum (Sea of Vapours) and, further north, Mare Frigoris (Sea of Cold), lay between both hemispheres. 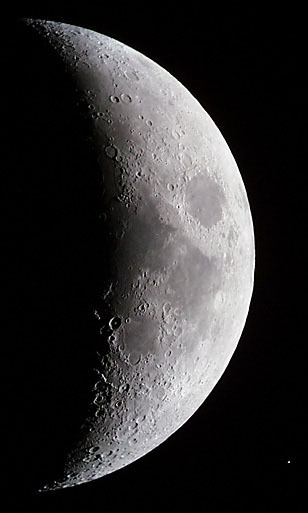 In contrast to its western counterpart, the Moon's eastern hemisphere contains the Mare Fecunditatis (Sea of Fertility), Mare Nectaris (Sea of Nectar), Mare Serenitatis (Sea of Serenity) and Mare Tranquillitatis (Sea of Tranquillity). 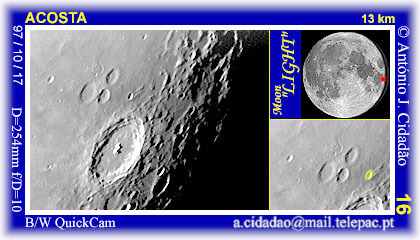 The Moon's eastern hemisphere thus seems to have been considered as a rather favorable place, or of good augur, to early astronomers! An apparent exception is the discrete Mare Crisium (Sea of Crises), near the Moon's eastern limb. 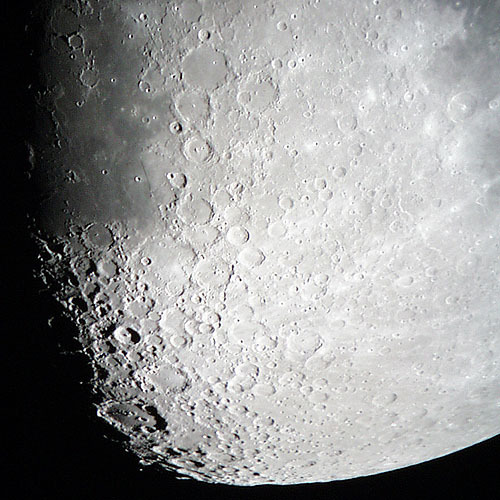 Of course, we now know the the Moon's environment is totally incompatible with life, except for astronauts wearing space-suits. 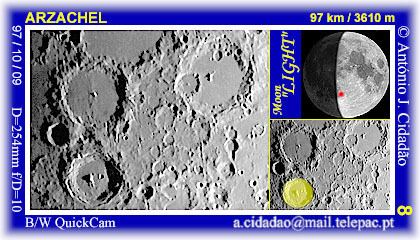 By the way, since its exploration, the Moon is considered a true world and the selenographic coordinates now applied are similar to those used on Earth. In other words, the eastern and western orientations on the Moon are reversed with respect to the east-west celestial coordinates. 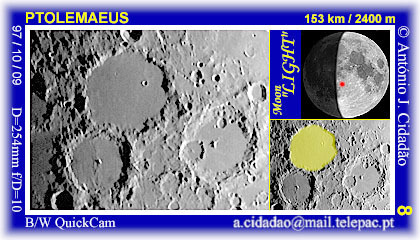 Therefore, Oceanus Procellarum, at the left side of the above images lays on the Moon's western hemisphere, and Mare Crisium, near the right limb also in the above images, is located on the eastern hemisphere. 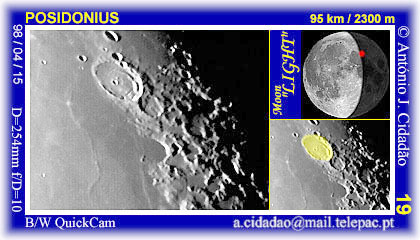 The Moon also has various tiny maria, namely Mare Anguis (Serpent Sea), Mare Humboldtianum (Humboldt's Sea), Mare Spumans (Foaming Sea) and Mare Undarum (Sea of Waves). 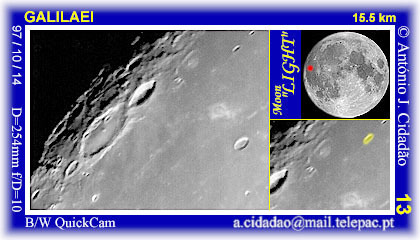 Finally, some maria are located near the limb, and thus are only partially viewed from Earth. 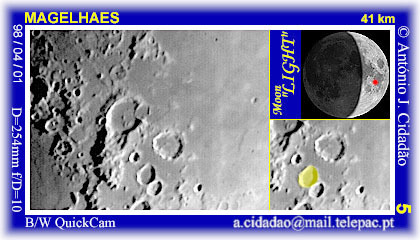 Examples are Mare Australe (Southern Sea), Mare Marginis (Border Sea), Mare Orientale (Eastern Sea) and Mare Smythii (Smyth's Sea). Analyzing the global distribution of maria and terrae, it is evident that the former dominate the Moon's western hemisphere while in the east the latter prevail. 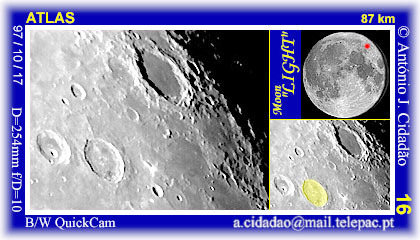 It is for this simple reason that, at first-quarter, the Moon is considerably brighter than when it is is observed at last-quarter (see title image above). 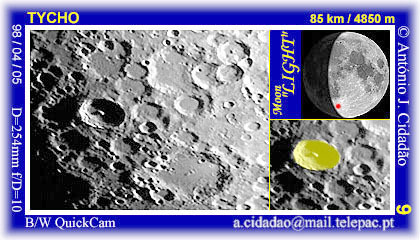 Major impact craters can already be distinguished with small instruments. 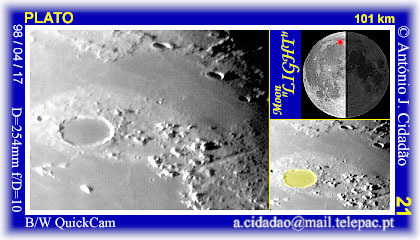 At certain times, particularly at or near full-moon, some craters (yellow dots in above right image) are seen associated with bright irregular lines that irradiate from them (cyan lines). 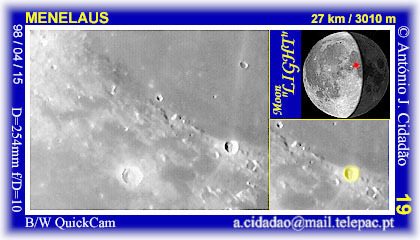 These are called lunar rays, and correspond to the ejecta that were produced during the impacts that originated the craters. 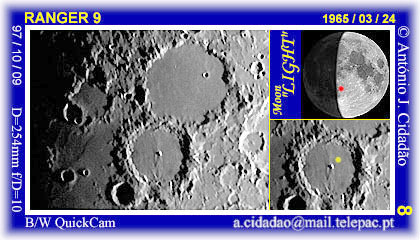 Bright and/or ray-associated craters are usually recent events (at an astronomical time-scale), and not always correspond to the larger craters visible on the Moon. 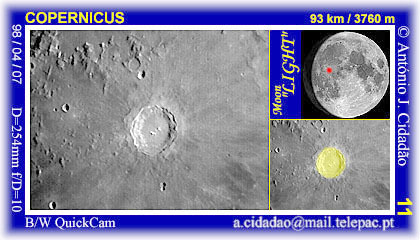 Some of the ray systems that can be easily spotted with small instruments are those associated with craters Tycho (1), Byrgius A (2), Kepler (3), Copernicus (4), Aristarchus (5), Anaxagoras (6), Thales (7), Proclus (8) and Stevinus A (9). 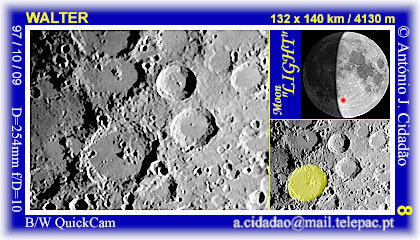 Other craters easily spotted with binoculars have dark floors, like for instance Plato and Grimaldi. 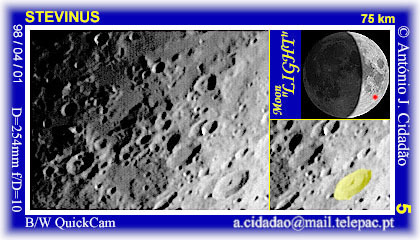 This appearance usually correspond to craters that were partially flooded with mare lava. Except when at new- or full-moon, our satellite always shows a distinct boundary between illuminated and non-illuminated hemispheres. This interface is called the terminator. 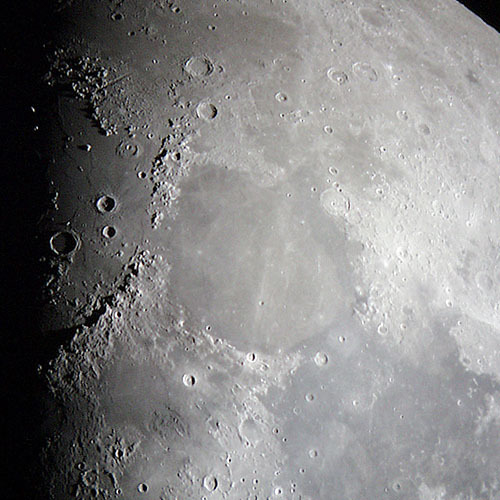 The telescopic observation at or near the terminator is extremely informative because lunar formations laying at that place cast long shadows that bring up its relief. 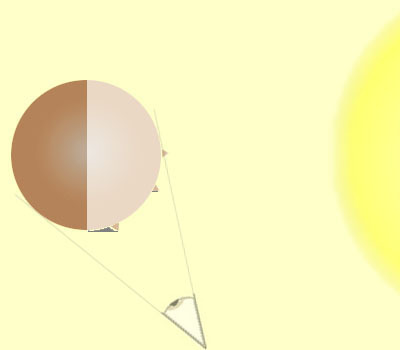 This strong 3-D perception can however be misleading, since long shadows may exaggerate the object's height or shape. 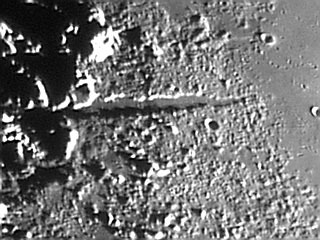 Take for instance the lunar scarp known as Rupes Recta, also seen here at low-angle illumination just south of Promontorium Taenarium. 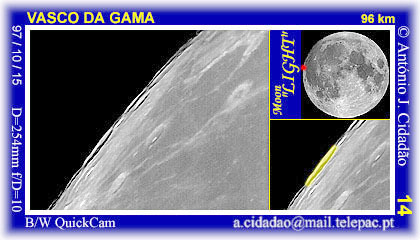 The long and strait shadow it casts make it visible in small instruments. 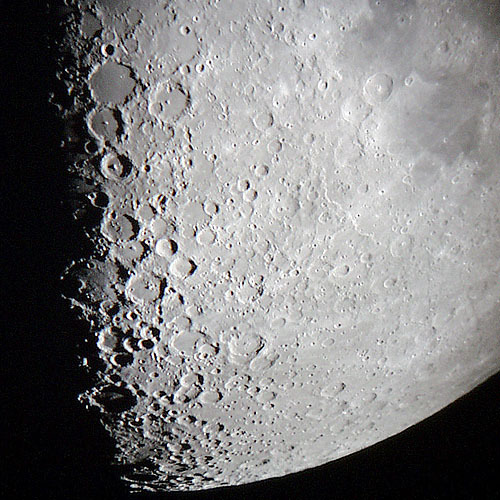 Can you spot it in this wide-angle view of the southeastern quadrant of the Moon? 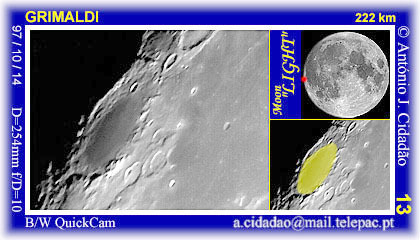 Well, this lunar formation is nothing but a gentle slope with a maximum height of about 300 meters and an inclination of around 7°. 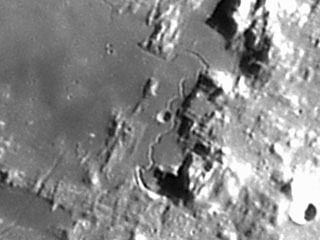 It is really not the steep scarp it once was believed to be. 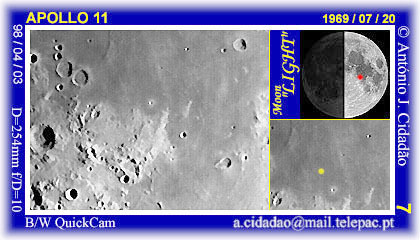 Higher resolution images of this formation can be found here and here. 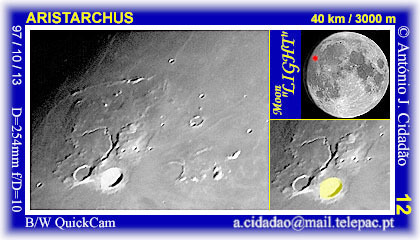 The "inflation" of the vertical dimensions of lunar formations near the terminator is however very useful, since it allows us to better visualize the remnants of highly eroded or flooded objects like crater Stadius. 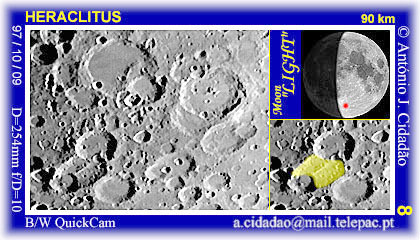 A higher resolution image of Stadius is shown here. 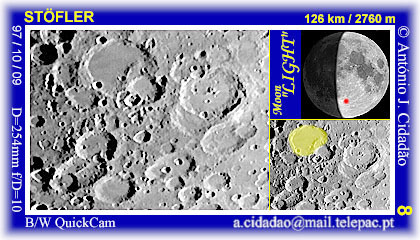 The reason why long shadows are produced near the terminator is shown in the above drawing (the Sun is yellow, and the Moon's illuminated hemisphere is light brown). 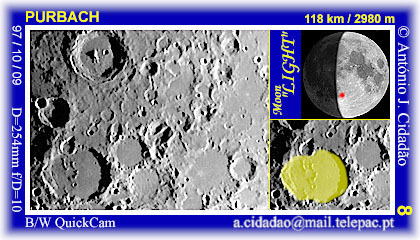 Compare it with the previous image, and confirm that lunar formations at the eastern limb, that is very far from the terminator, are devoid of shadows at this specific Sun-Moon-Earth geometry. 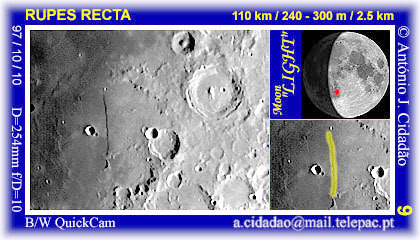 Increasing the magnification provided by the telescope will allow us to view more and more details, namely isolated mountains or mountain ranges, valleys and smaller craters, and to confirm that regions occupied by maria (above image) do exhibit a lower density of visible craters when compared to terrae-dominated sectors of the Moon, such as the southern highlands shown in the image below. 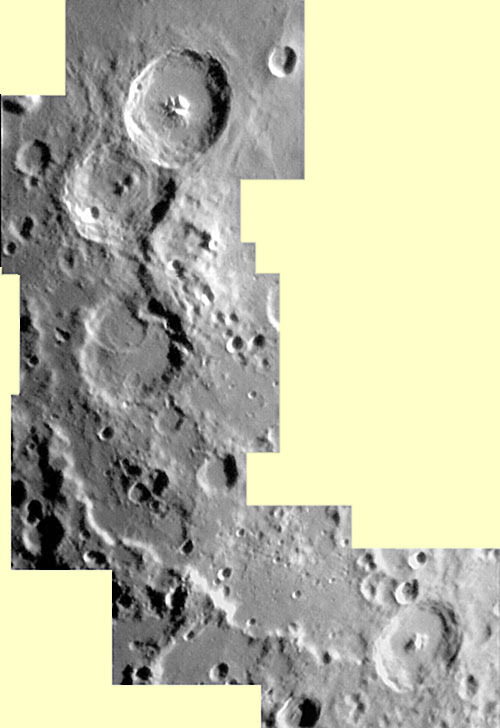 Mare Serenitatis occupies the center of the above image. The shade of its surface is not uniform (here darker at the periphery), an observation that is common to other maria. 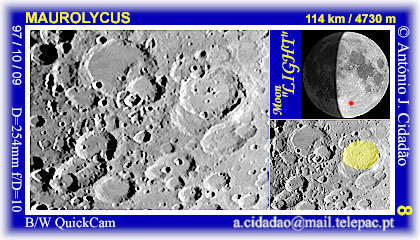 Only three moderate-sized craters can be seen within it, namely (from north to south) Luther, Bessel and Sulpicius Gallus. 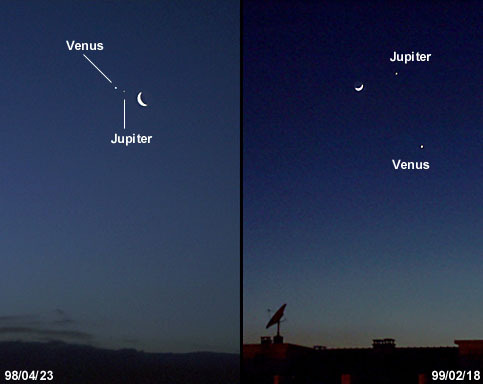 A higher resolution image of the latter can be found here. 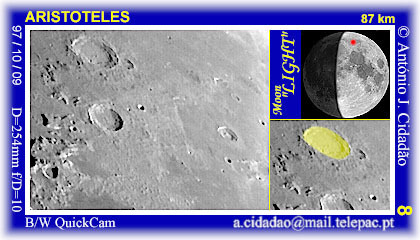 However, in nights of favorable seeing conditions numerous small kilometer-sized claterlets pop into view. 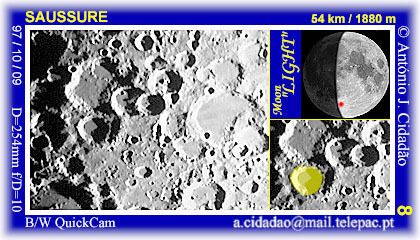 Take for instance Linné, a small crater surrounded by light material, that was made "famous" by the fact that various observers have reported changes in its size and appearance. 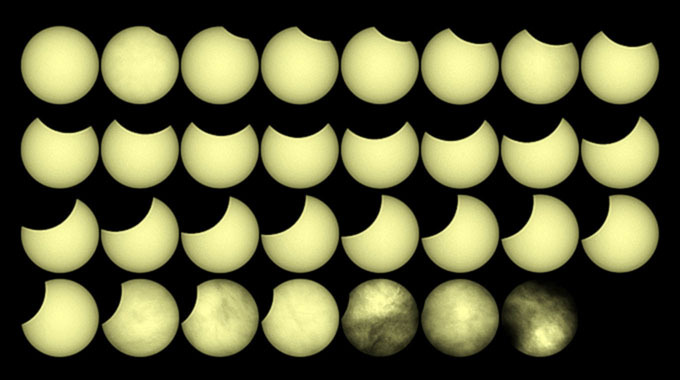 It is just an example of what may occur when an object, whose size resembles that of resolving power of a given telescope, is visualized in less than perfect seeing conditions. 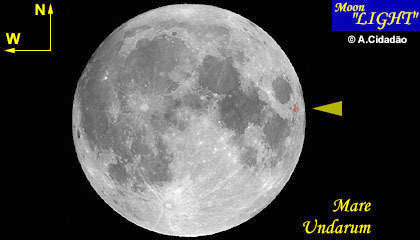 Sometimes it is just impossible to see it. 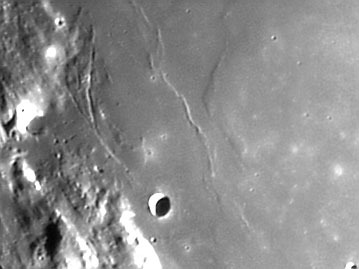 A part of Mare Tranquillitatis is seen at the lower-right corner while Mare Imbrium, still almost immersed in the shadow, appears at the left. Let's focus a little bit our attention on the latter. Three remarkable mountain ranges mark the eastern limit of this mare. From north to south we have the Alpes, the Caucasus and the Apenninus Montes. 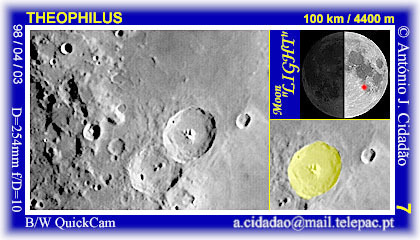 The Alpes are crossed by a 10 kilometer-wide valley called Vallis Alpes, and a very small instrument is sufficient to reveal it. 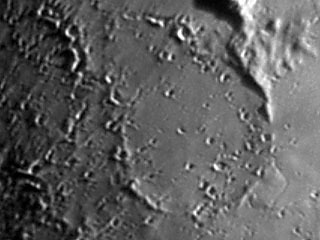 With larger apertures and excellent seeing conditions, however, it is possible to glimpse a narrow cleft that runs parallel to the length of the valley. 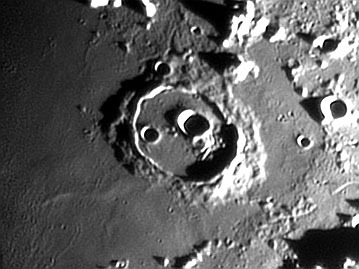 Between Alpes and Caucasus Montes lays the beautiful crater Cassini, named after the astronomer which discovered four of Saturn's satellites and the main division between Saturn's rings. 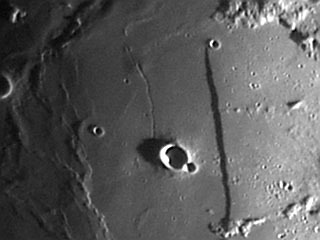 A higher resolution view of crater Cassini, still illuminated at a very low-angle, can be found here. 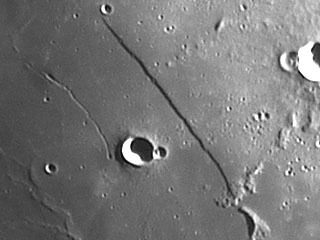 Near the western slope of the Apenninus Montes is the landing site of the Apollo 15 mission, at close vicinity to a well-known lunar sinuous rille, Rima Hadley. 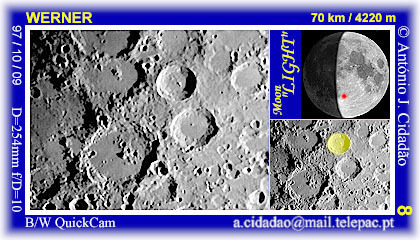 A great sight with large aperture telescopes. 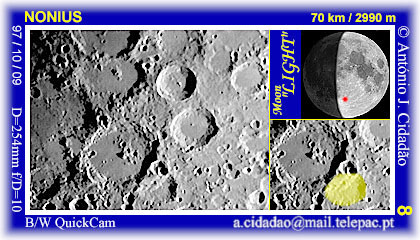 The field-of-view of the above image contains lots of other interesting lunar formations, far too many to mention at this moment. 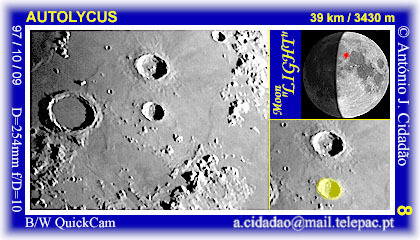 With respect to craters, however, I would like to mention the trio composed of Archimedes, Autolycus and Aristillus, all located in Mare Imbrium. 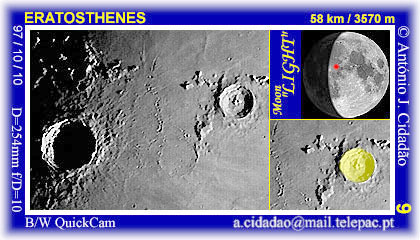 Two other crater pairs are remarkable, Aristoteles and Eudoxus that are oriented in the north-south direction and, here more distant from the terminator, the east-west oriented Atlas and Hercules. 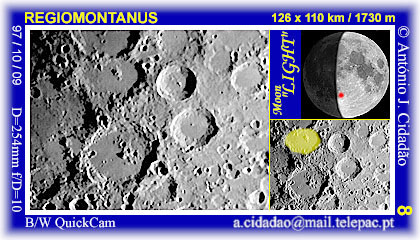 Just another example of a crater that deserves seeing under low-angle illumination is Posidonius, located at the eastern border of Mare Serenitatis. On the other hand, craters Menelaus and Manilius (both located south of the same mare), become extremely bright at full-moon. A more detailed description of the various types of lunar formations is presented in the next part of this section. 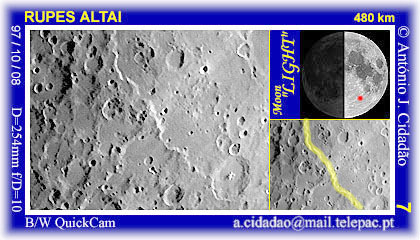 From this moment on, however, I would also like to invite you to begin exploring the MOON-"Light" Atlas, another section of this web-page. 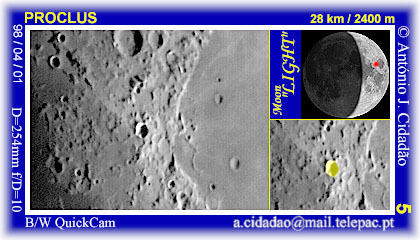 Why not try a virtual tour to the landing- or crashing-sites of all successful lunar missions? 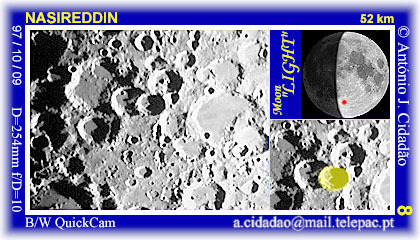 Yes..., some probes were sent to the Moon in order to obtain as many and as detailed images they could before they crashed onto the surface. 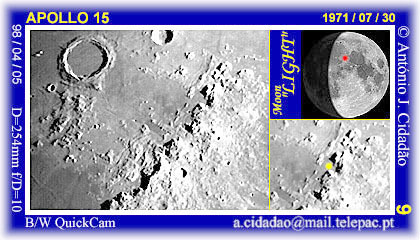 An example is Ranger 9 which, in 1965, managed to obtain high-resolution images of the floor of crater Alphonsus just before impact. Although the MOON-"Light" Atlas bears an extensive collection of identified lunar formations, the higher-resolution images of the Moon I have obtained so far are all grouped in the "CCD images of the MOON" section of this web-page. Also feel free to visit it!